« Are Government Schools a Form of Child Abuse? I haven’t written much about the budget fights over a government shutdown, Obamacare, the continuing resolution, and the debt limit for the simple reason that the battles are mostly about politics and strategy rather than policy. At the risk of oversimplifying, here’s what’s happening. On one side are those who want to use the debt limit (legislation allowing additional borrowing) and the continuing resolution (a spending bill for the fiscal year that starts October 1) as leverage to weaken Obamacare and restrain spending. On the other side are those who say big confrontations are too politically risky, particularly since good changes are impossible with Harry Reid controlling the Senate and Obama in the White House. In this “insurgents” vs “establishment” fight, I think it’s possible for good people to have opposing positions, but my sympathies are with the former over the latter. Here are a couple of observations to illustrate why I think the insurgents are correct. 1. The biggest fiscal policy victory of the 21st Century – sequestration – was only possible because of hard-ball tactics on the debt limit in 2011. 2. It’s always better to be on offense. If folks like Senator Ted Cruz weren’t making the President’s unpopular healthcare law the focus of attention, the crowd in Washington might be busy right now trying to do something destructive such as class-warfare tax hikes. Or repealing sequestration. 3. It’s common sense in any negotiation to ask for more than you think you’ll get and to appear as inflexible as possible. While I think many of the “establishment” types are willing to do the right thing (as evidenced by near-unanimous votes for the Ryan budgets), they sometimes lead with their fallback position, which means the final result will be even further to the left. 4. The “political risks” of a shutdown fight or a debt limit fight are greatly overblown. As I explained in an article for National Review back in 2011, Republicans achieved a policy victory and – at worst – a political draw in the big shutdown fights of 1995-1996. And my recent testimony to the Joint Economic Committee explained why there’s no risk of default if there’s a fight on the debt limit. All this being said, the insurgent strategy can backfire. 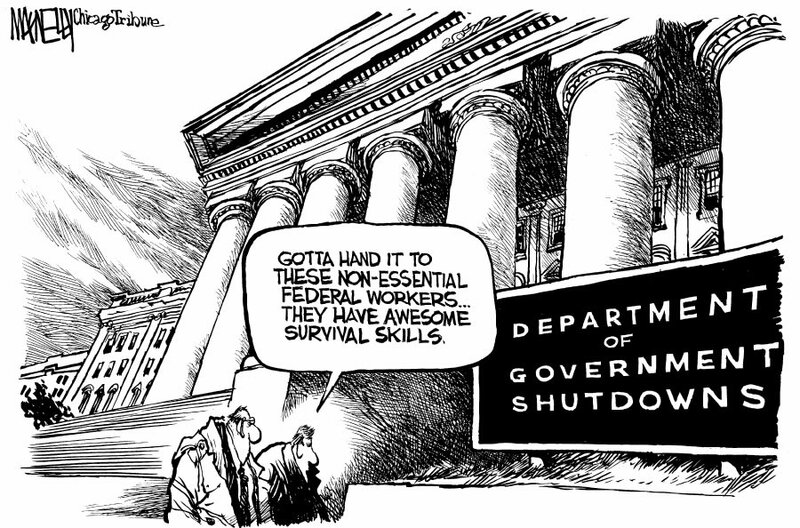 The media serves as an echo chamber for proponents of bigger government, so expect story after story about how a government shutdown threatens the economy (even though we’ve had plenty of shutdowns in recent decades with no negative impact). And expect stories about how a debt limit fight could mean default, even though that’s preposterously inaccurate. But that echo chamber can be effective, particularly when statist GOPers such as Karl Rove mimic those left-wing talking points. So the real issue is whether we can get some incremental progress – such as a one-year delay of Obamacare’s individual mandate – when a deal finally is reached. The main thing to understand, though, is that no progress would be possible if the insurgents weren’t forcing the issue. P.S. 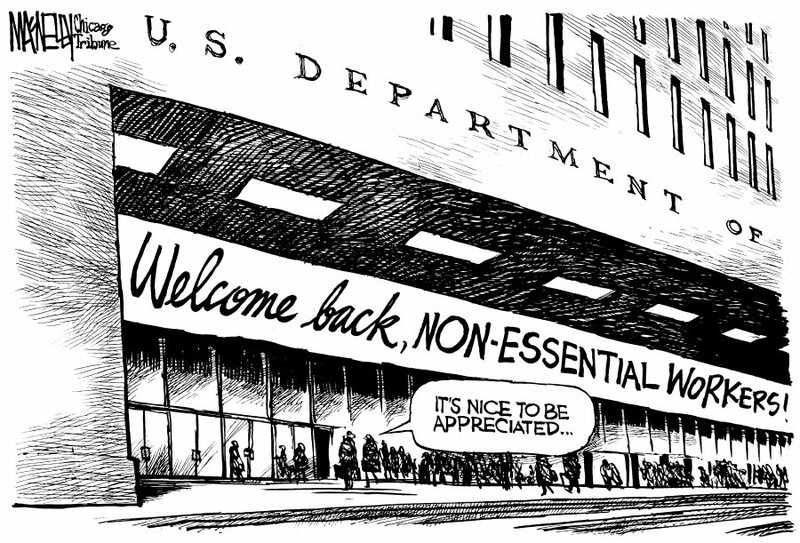 If you want to end on a lighter note, there are some good one-liners about the debt limit at the bottom of this post, and you can enjoy some good debt limit cartoons by clicking here and here. I’m still not convinced of the wisdom, politically, of a one-year delay in the individual mandate. it will certainly make the Democrats less unlikeable in the upcoming midterms. if it rolls out in 2015, the public has a full year to forget about it come the 2016 national election. I suppose there’s a chance it could hurt Hillary (presuming), but I’m just not convinced. might be best to just let it roll out now and hammer the Dems with it in 2014. I mean, the Dems want to delay it too. if they want it, it’s probably good for them. what’s good for them is manifestly bad for the country. the Rep. is not the one that is shutting down the govt. the Dem. are the one shutting down the govt. they wont even listen to the Rep. the Rep. tried and Harry Reid will not even give a inch the Rep. have sent over 4 solution they will not even come over and listen to the solution so the Dem. are the one shutting down the Govt. not the Rep.
if indeed all politics are local… when the full impact of the aca becomes evident at the local level… democRATS… can expect to be greeted by constituents with bags of feathers and hot tar…. The latest CR passed by the House (delay Obamacare for a year, repeal the medical device tax) should play better with the public than a total defunding. They should make Reid and Obama feel the heat on the “fairness” issue.